These Hungarian summer pickles are fermented by the heat of the sun, so they should be made in the summer or in warm climates. It's from Linda Ziedrich's "The Joy of Pickling" (The Harvard Common Press, 1998), and it's one of the easiest ways to pickle cucumbers. Best of all, you can vary the amount from 1 quart to as many gallons as you like, and they only take 5 days to mature. Since they are not canned, they must be refrigerated, where they will hold nicely for several weeks. The ingredient list calls for 1 head of dill in addition to a frond of dill (the feathery part). A dill head is the flowering part of the dill plant when it is ready to go to seed and from which dill seed is obtained. If you don't grow your own dill or have access to a dill head, use more of the feathery part. Gently wash the cucumbers, and remove the blossom ends. Using a knife, slit the cucumbers through lengthwise just short of the end, so they are still attached. Place pickling salt or kosher salt, white vinegar, and dill head and dill frond into a narrow-mouth quart jar. 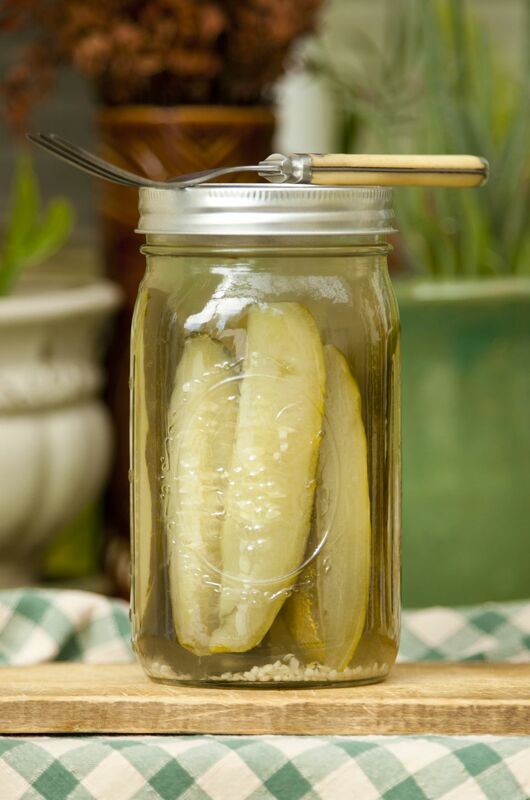 Pack cucumbers tightly into jar so they won't float, leaving 1 inch headspace. Pour in water to cover and cap the jar with a nonreactive lid. Place the jar outside in the sun or in a sunny window (place a saucer under the jar to catch any drips). Bring the jar in at night. Within 3 days, you should see tiny bubbles, indicating the cucumbers are fermenting. When the tiny bubbles have stopped rising (around 5 days), place in refrigerator. They will keep about 2 weeks, refrigerated.